Secret Golf's Steve Elkington and Mike Maves travel to Dublin, Texas and uncover secrets to one of golf's true legends, Ben Hogan. They also have a throwback smackdown by channeling the "Hogan Mystique" at P.A.R. Country Club, and get a vist from another legend, Bruce Devlin. NARRATOR: On this episode of "Secret Golf," we travel deep into the heart of Texas to uncover secrets one of golf's true legends. -Hogan's life was scattered with tragedy and-- and triumph, and, uh, not much in between. NARRATOR: We study just how Hogan forged his legendary game from head to toe. STEVE ELKINGTON: Everything he did was real economical, the way he built his game and the way he built his swing. Whether it was the extra spike in the shoe, or everything he did had a purpose. NARRATOR: And we have a throwback smackdown by channeling the Hogan mystique. STEVE ELKINGTON: We all got off the team real well, and Mike and I wanted to come down and play with the woods. They still fly great. They still go far and straight and all that. THEME SONG: It's "Secret Golf." It's what I'm looking for. It's why I get up every morning, call my good-timing friends. It keeps me coming back for more, "Secret Golf." We're headed down the road. We're just loading up the big show, gone looking for the heart of the stone. Rolling until the wheels fall off, it's "Secret Golf." Shh. It's a secret. STEVE ELKINGTON: We are here in Dublin Texas. My co-founder history buff Mike Maves is with me. Why are we in Dublin Texas? MIKE MAVES: We're here because every year there's a pilgrimage to this town to celebrate the life of one of the greatest golfers of all time. -We're talking about Ben Hogan, and we're here this week to get out all the secrets of Ben Hogan. There's a lot of myths, Mike. Where he was born, when he actually lived here. And guess what? They have a museum here. NARRATOR: To keep Hogan's legacy alive, enthusiasts trek to his hometown for the Cow Pasture Open, which serves as the museum's annual fundraiser. -And I know you are right in the spirit of it, because you wore that hat. -Let's go find out about everything we can about Ben Hogan. NARRATOR: One man's accomplishments will forever leave a profound impact on the game of golf. With 64 PGA tour titles etched in history, Ben Hogan is one of only five men to ever complete a career grand slam. As a captivating master in sports lore, the legendary Hogan mystique amazes men to this day. -I think Hogan's success had to do with perseverance, of course. But it also had to do with, uh, an extreme intellect. This is someone who has enormous challenges and difficulties. -Hogan's life was scattered with tragedy and-- and triumph, and, uh, not much in between when you take in that-- his father committing suicide, and then the accident that he was hit by a bus. I think Hogan had passion, and I think he had a pretty good plan of what he was trying to do. -A lot of people know he was a great golfer, but not many people know what he had to go through to get there. And-- and that's what really drew me to him as a person, not just the golfer. NARRATOR: Living an extraordinary life on and off the course, Ben Hogan's notoriety to the game will never be forgotten. So much so that a lone tee box sequestered in a cow pasture still attracts the Hawks fans close to a century later. -This is where Ben Hogan won his last amateur event in 1929. MIKE MAVES: It's a very special thing to go on to the Dublin DeLeon Golf Course. And when we visited that land, we were visiting history, because something very special happened there. And the fact that these folks commemorate it every year is, uh-- it's wonderful. STEVE ELKINGTON: You must be Karen. 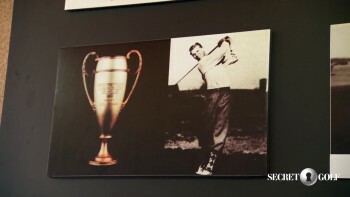 -Welcome to the Ben Hogan Museum. -Today we want to get down to some of the little secrets and make sure there's no more myths about Ben Hogan. -Can we get that done with you? KAREN WRIGHT: He was given what's called the Hickok Award, and it was solid gold. Mr. Hogan had it put in the Hogan room at Colonial. STEVE ELKINGTON: This is in the United States? KAREN WRIGHT: Yes. Keeping in mind, this was only three years after the car wreck. And he was making this amazing comeback where he had just won the triple crown. 1980, it was stolen. However, that was only the beginning of the saga. A few years before Mr. Hogan died, it was stolen again, and this time it was destroyed. The Colonial folks persuaded the Hogan family to create a replica build. However, three years ago in June, there was a break in at the USGA Museum. The thieves took two things. 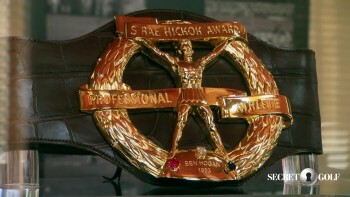 They took the PGA trophy, which was not Mr Hogan's, and they took the replica Hickok belt. The family was persuaded to do another replica to go back to the USGA, and as a surprise to us, they had a-- had a second one made for us. STEVE ELKINGTON: Oh, that's fantastic. KAREN WRIGHT: This was our Christmas present last year. 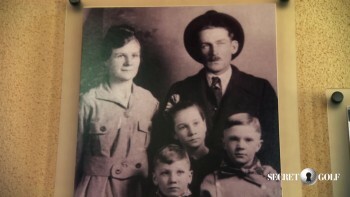 OK, one of the important things about the Hogan childhood was that his father, his grandfather, and his great grandfather were all blacksmiths. His toys were actually the tools of blacksmithing. Why is that important, students? -I think the reason that Hogan was so ahead of his time with-- with the clubs is he-- he sort of had the mind of both an engineer, and he had the experience from his father's blacksmith shop in forging iron. -This is a very interesting, uh, part of the museum to me, because Hogan set the standard for golf clubs. MIKE MAVES: The 53 Precision. That's the-- the first model that-- that came out, and those were the clubs that he turned to even into the 1960s. He might be using other clubs that were done, but when it was time to compete, he went back and put the old Precision's in the bag. -But not-- the name says a lot. -Precision, there you go. Hogan designs the club, works with his guys. They make the club. They set it up to his specs. And then he goes out and starts swinging them and hitting balls with them. NARRATOR: A man of like mind joined our Hogan fanatics at the P.A.R. 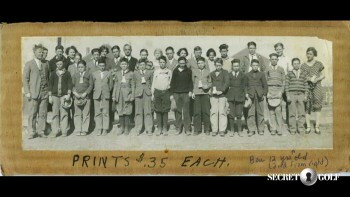 Country Club in Comanche, Texas, with his own tribute to bantam Ben, his 7-year-old son, whom he named in Ben Hogan's honor. Michael Jones serves on the board for the Ben Hogan Museum, and drove in from Oklahoma with his son for the fundraising tournament. MIKE JONES: It's good for me he as a Hogan fan, because somebody that owns eight sets of Hogan clubs and named his son after Ben Hogan, I'm not looked upon as a crazy among all the other crazies. So it's nice to be here among the other fans. NARRATOR: Mike and Ben also came in to play in our secret smackdown, which meant some quality time on the range with Elk. -I want you to use your hips there to hit it with. The first thing I always start with kids is I got to get their grip on right. And the grip's a little tricky when they're little, because they-- they still don't have the strength. MIKE JONES: I was looking forward to playing with them all week, and I was hoping there'd be some range time where-- where maybe there'd be some tips. -There's what we call a start position or the address, Mike, and I know you can relate to this, and then there's an impact position. Now impact does not look anything like address. And when I taught my son Sam is I say, Sam, show me address. Show me impact. Show me address. Show me impact. And what happens is then when they go back, their brain starts to feel them up there further. See, golf can be really cool if-- for kids if they can hit it. Soon as they know how to hit it, then they can scramble. Then they can hit funky shots, make it curve, all these things. All that's possible. I did it with my son Sam. But their attention span is short, and it-- well, it should be. They're only-- he's only just turned 7, but I thought he was the most charismatic 7-year-old in the history of the world. We're down here celebrating the Cow Pasture Classic and everything about Ben Hogan. Mike, thank you for bringing your son, Little Ben, down here to play a three hole-- we're going to call it the Ben Hogan smackdown this week. And we're at number 13 at par five. OK. Little-- little control fade. OK, Mike, you're going with the 1965 Hogan special. MIKE MAVES: The par five hole, the water at front, it-- it immediately gets you, uh, a little bit intimidated. We're playing with the old clubs, so that added another little level of-- of concern. -I like to see it go in the air. STEVE ELKINGTON: We all got off the tee real well, and Mike and I wanted to come down and play with the woods. They still fly great. They still go far and straight and all that. Yeah. Well played. Oh, yeah. Good shot. Our goal for Ben was just to get him to hit in down the middle, and get him on the green where he could make something happen. MIKE JONES: Elk was every bit as great as I knew he would be, and I thought Ben did a pretty good job holding his own, too. It was a lot of fun watching those two together for me. It really was. STEVE ELKINGTON: Oh, this could be all right. STEVE ELKINGTON: Look at this shot. STEVE ELKINGTON: Oh, well played. MIKE MAVES: Hang on, baby. That's a nice-- nicely played. STEVE ELKINGTON: Oh, he did go up with it. Boy, that's pretty. Yeah, well played. -We were on the green in two. Do you know what we're putting for? MIKE MAVES: There we go. MIKE MAVES: Now we got something. -That's an easy birdie, isn't it? -Atta boy. Well done. Good putt. -Oh, my God. He just made a [INAUDIBLE]. How'd you know that? How'd you know he was gonna make that? 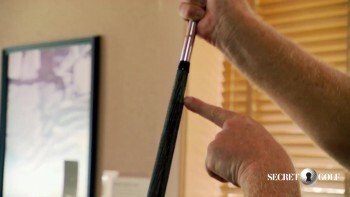 STEVE ELKINGTON: We were admiring-- that's a set of real Ben Hogan clubs, and we've never really ever touched a set of, like, the man's himself. The coup de gras was-- was a set of Hogan clubs behind glass in there, and I asked Karen the curator of the museum if we could possibly open it. And she was the most darling person to let us do it. And when Mike and I got our hands on that set of Hogan clubs, we knew they were his. And we knew that as soon as we grabbed it, because of the way he calibrated the-- the rib on the back of the club with an old coat hanger. Oh, feel that. That's so sick. I can't-- I can't get over the reminder. So again, you can see the lump. Looks like there's something buried under the grip there, which there is. It's a wire-- piece of wire coat hanger set to the right underneath, so when you put your hand on, you wrap it over, it takes the face-- I'll put it up here for contrast-- it makes the face open. See that up on-- up on the board? There's normal-- sets open so that he could smash it with his right hand and never hook the ball. Look how sharp. No bounce. MIKE MAVES: So they would be set up as sharp as his-- as Precision's were. -Yeah. It's just-- just like a-- like a-- one of these. -And when you-- and when you grabbed Hogan's clubs, and you know what he was doing with his swing, and you've read his book, you can almost feel like it's coming through your body. That he could just never hook that ball and just crush it with his right hand right there, and just-- just psh! There's two extra spikes on the bottom of that shoe in between the circular around the edge of the shoe. Everything he did was real economical, the way he built his game and the way he built his swing. Whether it was the extra spike in the shoe, or-- everything he did had a purpose, a distinct purpose. MIKE MAVES: In London, yeah. The move, the extra spike-- all of those things-- it's about building things into address that you want to take-- uh, take advantage of in the swing. -See, that's what we'd call it, a 7 millimeter spike right there. That's the maximum length there that you can have for a spike. So Hogan, you know, had extras. MIKE MAVES: So extra traction. He's engineered everything from the-- from the ground up, from the shaft to the grips to the-- everything's engineered to work one way. -So our company started five years ago from me watching a video called The Move. And Mike's whole video-- how we met-- was him discussing the move, and what his interpretation was of why Hogan put the extra spike in the shoe. -Hogan, he had an extra spike on his right foot, OK? Well, he-- I mean, who-- who mails off to England to get, uh, an extra spike-- uh, a shoe with extra spikes? Ben Hogan did. Why? Because that spike was the focal point of his balance on his back swing. 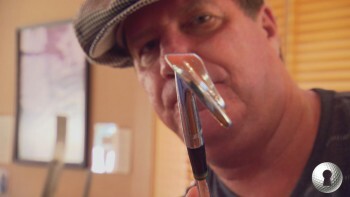 STEVE ELKINGTON: You're saying that your toes are in the right side of that shoe. STEVE ELKINGTON: And then when you got to the top of the swing, you turn it more to the clockwise. And that's what sends you the other way. -So if I demonstrated here, I've got that wound in. And you went up, and about here, you sent it the other way. -And by the way, I've used that ever since. Well, when I saw Maves' video, I've never seen a guy get to his left side as easy as Mike. Boom. He's just got that-- it's so easy moving that weight. So that started our company. -And Elk, it didn't take long. -You see how easy he gets? He gets through so easy. He's a bigger guy, and he's got a big-- big lower-- lower case, and he just-- psh-- gets through the ball so nice. And that's envious to a lot of people. And it was his interpretation of what Hogan did. We don't know if it was, but we know that-- we know one thing about Hogan. When he put-- when he did something, it had a meaning. -So the right shoe-- the right spike in the right shoe had something to do with something. STEVE ELKINGTON: This hole is the 14th hole on this course, and it is a pretty short par four. Oh, yeah. Wow. That was solid. Those woods are solid, huh? You're on the green. It landed short. It's on the green. MIKE MAVES: I got a little lucky that I didn't hit it on the button, because I necked it a bit and that made it cut. And that-- that also put some spin on it, so when it did land on that side, it stopped pretty quick. BEN JONES: Come on, ball. MIKE JONES: Be the one. STEVE ELKINGTON: Oh, no. I think it's short. MIKE MAVES: Oh, you're there! STEVE ELKINGTON: It got over the hill by like that fast. You see that? Woo! -I want you to chip that ball up next to the hole for me. -Come on, Elk. Chip this one in. -OK. You got it. I like-- you're a positive guy. I like you. MIKE MAVES: Good one, Elk. -Don't mess around. Go ahead and get that one in there. -Put it in, Benny. Nice putt. -Those boys got a putt at an eagle. Oh, look at this putt. Wait a second. Look at this. -That's well played. I think we'll give him that one as a bird. Oh, look at this. Oh! -Good try. Good try. So that's a tie. When I was growing up in Australia, Bruce Devlin was my guy. He was so well-known in Australia, so well-liked, and he was on every trophy. He was my-- top of my mantle. He was the guy I was trying to chase down when I was a kid. NARRATOR: Elk and his hometown hero have been friends for almost 40 years, and it just so happens Bruce is here to play in the Hogan tournament. But more importantly, he is one of the few that really knew Hogan the man. -I got an invitation after winning the Australian Open in 1960 to play at Augusta in '61. I turned Clifford Roberts down. Not too many people have ever done that. BRUCE DEVLIN: I got re-invited back to Augusta in 1962 when Norman Von Nida, whom you recall, introduces me to Hogan. And-- and he said-- I didn't say anything. I was so scared to meet Hogan. He said, would you be kind enough to play a practice round with this young fella, Devlin? And Ben said, of course I would. I'd love to play with him. From that very first day, the Tuesday of Augusta in 1962, I played-- I won't say every practice round, but a lot of practice rounds with Hogan. He was what I would consider probably the most under understood men that I've ever met in my life. -Now the myth has broken that he was really nice to you then and all that. -He was great to me. -He was not mean to everyone. -Jackie Burke says he was the greatest. BRUCE DEVLIN: He was one of the nicest people you'd ever want to meet. STEVE ELKINGTON: He just liked you. -And he'd pick up my driver and he'd-- you know, he'd grab it like that and he'd say, still using that buggy whip, huh? -Because he's got no buggy whip. BRUCE DEVLIN: Oh, man. His was so stiff, and, of course, as you said, you know, the face is running away like this. 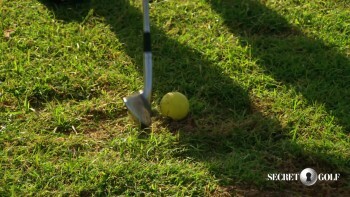 And I pick his driver up, and I'd try the hardest I could to hit it straight and it'd still go like this. -Still go like that. What a great chance it's been to have Bruce Devlin drop in on us. BRUCE DEVLIN: Thank you. Nice to be here. -And it all started right here in North Texas at [INAUDIBLE]. -Great to be here, buddy. Thank you. MIKE JONES: He's not letting us off the hook on that. BEN JONES: Whoever wins gets to have ice cream. MIKE JONES: I hit a six iron there-- I think it was 170 yards. And I was just a little over to the right, but close to pin high. BEN JONES: Let's get a good one, Elk. STEVE ELKINGTON: I know how important it was for Ben to say to me, good shot, Elk. That made me feel really good, and I'm sure it was exciting for his dad to see the interaction between me and Ben, because he's brought him up around the game. A little Ben-- we put him off the front tee, and he's just having a ball out there. Whoever knocks this putt in could be the winner. Uh-oh. Uh-oh. -Uh-oh. Oh, he had it right on line. MIKE JONES: Someone sends one and it's on its way, you've got some time to watch it and think, oh, my god. Is that going to go in? And that's how I felt with Elk's putt, because he sort of sent it on a pretty decent line. So I'm sitting going, man, we played so good, and we're going to lose when this thing's half way there? -I think Ben got to see an important part of the game. Everything from working together as a team-- yes, it's an individual sport, but that's the first scramble that Ben's ever played in. And so he got to see a little bit of the team aspect of the game, how that can work. I think he helped out his-- his team pretty well today. Held his own end up, so I was proud of him. -I wanna say it's a good start, and I hope it's like this everyday. It's not about winning. It's about having fun. STEVE ELKINGTON: This show would have to be considered one of the cornerstone shows for "Secret Golf" as far as appreciation of what we're all about. You got to be kidding me. -I think the legacy that he leaves and the memory that he leaves is so important to keep alive and to preserve, and everything that he did to become the golfer and person that he was is-- is worth remembering. MIKE MAVES: Whether it was playing through poverty, playing through pain, but then to play again and win, that is a level of passion that may not ever be seen again in golf. -I have traveled to the Empire State to play the oldest public course in America, and that is the symbol of the Empire State. Hey, keep your shirt on. NARRATOR: --Elk takes a bite out of the Big Apple. -Mate, where are we on this map? STEVE ELKINGTON: I wasn't sure about what I was going to see up here. Uh, I've been in New York before, and, uh, we do like to mix it up with some characters and eventually get on the golf course. NARRATOR: --and gets in a round of golf like a true New Yorker. -Growing up in New York, if you wanted to play golf, you would get up at 4:00 in the morning, carry your clubs down six flights of stairs, go to the subway a mile away, wait for the subway, ride to the end of the line, walk through the park, and then it was first come first serve. STEVE ELKINGTON: I love New York. ALL (SINGING): In New York concrete jungle where dreams are made of. There's nothing they can't do out here in New York. Hey! NARRATOR: "Secret Golf with Steve Elkington has been a presentation of "Secret Golf" incorporated. MAN: Shh, it's a secret.